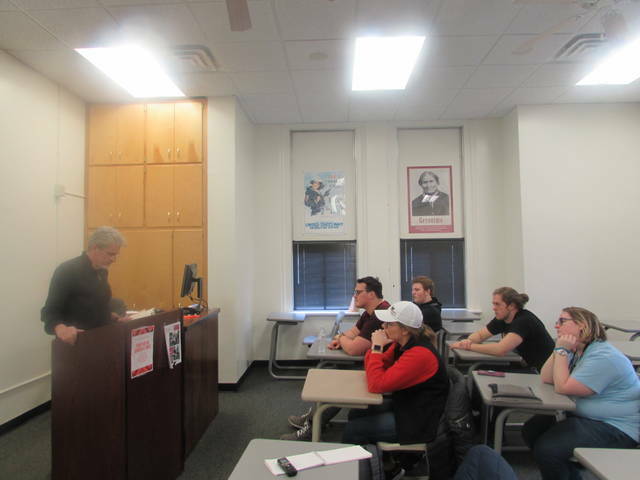 ADA — Philadelphia suspense thriller author James McCrone educated students at Ohio Northern University by speaking about his book “Faithless Elector” Friday that focuses on the topic of the Electoral College. McCrone spoke to political science professor Robert Alexander’s Intro to Government students. McCrone wrote the books “Dark Network” that came out in October 2017 and “Faithless Elector” that came out spring 2016, and he is working on the third installment in the trilogy titled “Who Governs” that is scheduled to be released next year. He has a master of fine arts degree in creative writing from the University of Washington. His work addresses politics and issues of personal social responsibility, accountability and justice. “’Faithless Elector’ is a political thriller about stealing the presidency by manipulating the Electoral College,” McCrone said. He read the Constitution and newspapers when he was researching his book, and he came across Alexander’s book that he wrote on presidential electors. “My students and I have done research where we have surveyed electors to find out who they are. We have found out that a lot of electors have thought about changing their votes,” Alexander said. During the 2016 election, McCrone wrote Alexander about the “Faithless Elector” book. During Friday’s presentation, he informed students that the Electoral College elects the president. In his fictional book — that came out before the most recent election — there is a situation where four electoral votes separate two candidates and if three of the electorates changed their vote the result could be overturned. There are 18 people who have chosen to be electors for each party and if the plurality has gone for Republican then on Dec. 19 in the capital the Republican electorates will show up and cast their ballots. They are pledged to vote for the Republican candidate. “Electors are not bound to vote as they pledged. They are like individual actors who make up their own minds,” McCrone said. He informed the class that each state received electors that is equal to their representation in Congress. There is plurality of votes, not a majority of votes. The novel focuses on an orchestrated conspiracy to overturn the election. The general election is Nov. 8, but the electors don’t meet until Dec. 19, so there are three to four weeks to change elector’s minds, according to McCrone. He hopes his presentation allowed students to learn more about the Electoral College and how it operates. The books can be purchased on Amazon.